Unwrapping the riddles in a mystery. Each day you are influenced by an algorithm in guiding your decisions and choices. Mathematical calculations are influencing your purchasing decisions on Amazon, your flight in an airport and even whether your supermarket has your favorite cereal in stock. As if by magic, you may be completely unaware of when an algorithm is at work. They act seamlessly between yourself and the task at hand. And while this might sound sinister, algorithms are, by and large, there to help you. Social media algorithms are becoming central to everything you do. Often misunderstood and occasionally inaccurate but always on and always learning. How you and most of society consume news and information can be attributed directly to algorithms. Algorithmic quality – the quality standard of the content available. Your previous history – the actions and reactions you’ve taken to specific chunks of content in the past. This means whether by design or by personal choice, social media algorithms have allowed us to create filters to see content we want and remove everything else we don’t. Coupled with recent claims that algorithms can be biased it’s important that they are understood and when they are at work. Perhaps even more so since people are more likely to follow advice when they are being told that it came from an algorithm rather than a human according to a Harvard Business School study. This has lead to articles providing guidance on how to think for yourself when algorithms control what you read. While this guide does not claim to lay out the exact inner-workings of the social media algorithms, it tries to include everything we know about them that is publicly available. What’s presented here is based on a combination of publicly disclosed information by the social networks, third-party research, some basic assumptions and a little common sense. Secondly, the diagrams presented are not visual representations of the algorithms. That would be impossible. Instead, they are more Decision Problems rather than algorithmic equations. Use them as a process and checklist you can follow to ensure your content and messaging has the best opportunity to receive maximum impact. Now in its third iteration, this guide is updated and expanded upon each year. The most influential kind of algorithm is one that controls the flow of information people receive. It helps shape their thinking and understanding of news and events. Perhaps there is no greater power than being able to control the kind of information a group of people consume. Over the years, social media platforms have become central to how people both communicate and receive information. Whether that’s keeping in touch with long-distance family members, organizing events, networking, running a business or keeping up with the news. Social networks have evolved from being a place where people connect to an information distribution platform. Many people now depend on social media algorithms to be informed and to keep up-to-date on news and events. In fact, research by the Pew Research Center found that in 2017 two thirds of American adults reported getting at least ‘some of their news’ from social media. As more people have started consuming information on social platforms, many publishers have taken advantage of the viral effect they can receive by having their content spread across them. Indeed many publishers built their entire business models based on the viral effect platforms like Facebook, Twitter and LinkedIn create. The content is optimized for shareability using persuasive techniques to create an emotional response in readers. Understanding how social media algorithms work empowers us to know when we are perhaps being manipulated by these publishers. Content creators – brands and individuals alike – need to understand how best to work with the social media algorithms to generate the best return for their content creating efforts. Time and again we see content go down a black hole because no consideration is given to a social media algorithm. What works on one social network may not work for another which is why it is important to understand how each algorithm works to create the content to suit it. Not that the social networks give us the ‘secret sauce’ to their algorithms. Most are notoriously hush about the inner workings of these often-complex mathematical equations. They do, however, provide tidbits of advice and information on occasion either through their official channels or by their employees on social media. In the early days of social networking, the intention was to connect people online who may not have been able to do so in real life. Family and friends on Facebook; colleagues and work acquaintances on LinkedIn and anybody and anyone on Twitter. As they grew and as each platform explored ways to monetize they began to diversify their offerings. News distribution was a key component of this. The social networks, and especially Facebook, began to see themselves as a conduit for news distribution. They changed their algorithms to suit this shift especially as more people began to receive their news via them. News publications worked on growing their audiences on these platforms and increasingly made content that was both snackable and shareable. In 2015, Facebook surpassed Google as the number one traffic source for news sites solidifying its place as a social networking behemoth. Clickbait articles, fake news, bots, trolls and political warfare began to dominate the platform. The Facebook algorithm, perhaps the most famous algorithm in the world, was at the center of it. People started reporting higher levels of anxiety and unhappiness after visiting Facebook and Twitter. They had turned into purveyors of outrage news and instead of connecting people they had created divisive groups. Since 2018, the tide has changed once again for the social media algorithms. LinkedIn is prioritizing status updates by its professional users who dare to be more personal and open about their lives. All of which are prioritizing content native to its platform over links to third-party sites. In 2018, search was a bigger referrer to news sites over social for the first time since 2015. It’s one reason why the influencer marketing industry is on the rise. Brands are looking to work with social media influencers who have developed deep connections with their audience. The algorithmic levers have been pulled once again. For many publishers, it has meant the end of traffic flow and in some cases the end of their entire business model. For brands looking to engage in social networks, it requires a mindset shift. It’s about building a community, not an audience. It’s about making content conversational instead of attention-grabbing. It’s ultimately about taking a more honest approach when engaging with people on social networks. A lack of understanding of how social media algorithms work is like driving in the dark with no lights on. It’s possible and you may get to your destination but it’s an unnecessary risk. The social networks are constantly changing, refining and testing their algorithms. It’s important we keep up with them. Ready? Then let’s begin and dive into the social media algorithms. Facebook has perhaps the most famous (or infamous) social media algorithm in the world. It has been at the epicentre of political controversy over the last few years, not just in the US and Europe but across the world. It is constantly evolving as Facebook looks to provide more value to users and more eyeballs for advertising spend and it has perhaps, along with the Google search algorithm, the main reason why layoffs continue in traditional and internet media. Formerly known as EdgeRank, it is fair to say that the Facebook algorithm has been in the spotlight for all the wrong reasons over the last few years. It’s a morbid situation: Organic reach is almost dead, the news feed is dying and clickbait and fake news are on their last legs. In 2014, Facebook page owners started noticing a decline in organic reach. While numbers vary, the average organic reach dropped from around 16% to 6.5%. A page with 10,000 fans would only reach just 650 of them. Page owners with more than 500,000 fans saw an event steeper drop to around 2%. The reason for this, Facebook said, was because there was simply more content being created on the platform and people should see only the most relevant to them. Since then, Facebook has continued to tweak the algorithm further decreasing a page’s organic reach further. Around the same time, its advertising revenues on the Facebook platform have almost hit their peak meaning it will soon depend on Instagram for the majority of its revenue growth. A Facebook page today is more for running an advertising campaign from rather than anything else. Stories have changed the social media landscape and it’s the news feed that’s taking the hit. The ephemeral pieces of content we see from our friends, family and influencers on Instagram, Snapchat and increasingly Facebook are what consumers want most. The news feed is a relic of the past and while it’s not going away anytime soon it will no longer have the same impact it has had on society again. Facebook itself sees stories as the future and says one billion of them are shared on its platform every day but has so far not being able to monetize them as much as its other ad inventory. Nevertheless, stories are the where the action is and never underestimate Facebook’s ability to monetize. To ‘go viral’ on Facebook used to be easy. Create a piece of content that people will share and, assuming you had decent distribution methods, it was guaranteed to spread across the Facebook platform. It’s what BuzzFeed based its business model on with other publications such as Unilad following suit. Content was engineered to be ‘clickable’ and ‘shareable’ by tapping into social psychology triggers that would evoke emotions of either love, humour, fear or anger. This strategy was of course copied in all kinds of unscrupulous ways often using content that was completely fake. The viral element of the old Facebook algorithm played a fundamental part in the 2016 Elections and Brexit in the UK. Both of which were largely played out on Facebook and both susceptible to fake news from fake websites and even clickbait from reputable news sources. While the Facebook platform still has a propensity to facilitate the sharing of fake news, the company is improving its ability to capture and eradicate it by recently removing 14 million pieces of terrorist content, setting up an ‘Election War Room’ to safeguard elections all around the world and by requiring users who run websites and political ad campaigns to verify their identity. Facebook user habits have also changed when it comes to sharing news. Concerned about privacy, they prefer to use messaging apps WhatsApp and Messenger (both Facebook Inc. owned) to share and discuss news with close friends and acquaintances according to one study. The accumulation of negative media coverage along with research finding that people feel less happy after visiting Facebook has prompted the company to make swift moves to eradicate the sharing of content that make people either mad, bad or sad. In Zuckerberg’s post, he outlines a new direction for Facebook with the algorithm at the centre of it. This means the Facebook algorithm will now prioritize content that drives discussions among friends and family as opposed to clickbait and links to third-party sites. The move prompted concerns by businesses and organizations that depend on Facebook as a communications platform. Most notably people in the publishing industry and indeed publishers like LittleThings and Unilad either shut down or were acquired because of the sudden dip in referral traffic from the new algorithm. With organic reach at an all-time low and the prioritization of communication between friends and family, many organizations question if Facebook is worth the effort at all. Given its sheer size and dominance online, Facebook is worth the effort but this algorithm change requires a new approach. What do we know about the Facebook algorithm in 2019? This is the new normal on Facebook and anyone looking to work with the algorithm will have to take this into consideration when developing content they want to do well on the platform. Don’t use Facebook as a means to share every piece of content you have. If it doesn’t generate engagement then your credibility score will decrease. Only share content you believe is suitable for the platform and audience you’re trying to engage. The Facebook algorithm will mark down clickbait and sensational articles, statuses that ask users to like, comment and share, and promotional updates. To be seen as credible in the eyes of the algorithm don’t do any of these. Twitter has had a rollercoaster ride since its inception to say the least. For years it was unprofitable and it wasn’t until 2018 it turned its first annual profit. Despite its profitability, Twitter is losing users which is partly to do with it cleaning up the platform and removing spam and bot accounts. It’s likely Twitter will remain a niche social network but the type of users it attracts is some of the most influential in the world. It’s a platform favored by the media and political elites and plays a key role in driving the news agenda. Twitter’s popularity among these people is likely to do with it being real-time, it’s easy and it doesn’t require any technical knowledge like writing a blog or creating a podcast. The Twitter algorithm, or the “Algorithmic Timeline” as Twitter calls it was introduced in 2016. Prior to this, when you logged in to Twitter your feed was in reverse-chronicle order with the latest tweets from the people you follow at the top of the page. When you log into Twitter now it’s a different story. It’s no longer in chronological order and your timeline may show a tweet from 30 minutes ago at the top of your page whereas there may be more recent tweets further down. This is the algorithm at work and is designed to provide you with the most relevant content first based on your previous use of the platform. These are the tweets that the algorithm thinks you will find most important. When you’re developing a Twitter strategy you have to take this into account. Twitter has no backtracked a little and provide users with an option to switch between the algorithmic and chronological timelines though it’s the former that comes as default. Like Facebook, Twitter has been on the receiving end of controversy in recent years. It has been accused of providing anonymous trolls and extremist groups a platform to spout vitriol and hate. And allowing Russian accounts and bots to meddle in the 2016 US presidential elections. In January last year, Twitter said it had removed 50,000 Russian-related accounts that used the platform to post automated material relating to 2016 elections. This has prompted a new change to the Twitter algorithm announced in February last year. From now on, automation (or bot usage) on the Twitter platform won’t be allowed. The intention of the Twitter algorithm is to make the timeline more relevant so users can catch important tweets that they would otherwise miss from people they engage with the most. At the same time, Twitter still considers itself as a live news site as well as a social platform. It reinforces this by asking “What’s happening?” when you log in to your account. So while the algorithm will show you older tweets first, time is still an important factor. And if you want your tweets to get as much reach and engagement as possible, you have to work with the algorithm. In September 2017, Twitter made one of its boldest changes yet by going from the 140 character limit to 280. There was outrage from users who believed this move would spell the demise of the platform. In hindsight, Twitter had a good plan based on analyzing engagement data on languages that could fit more context into a tweet. They found that tweets in Japanese – where the characters allow you to say more – received much more engagement than tweets in English. With that said, in October 2018 it was reported that the average tweet length is still only 35 characters. In another bold move by Twitter, in September 2018 it announced that users will be able to switch to the chronological timeline so they can see the latest post at the top of their feed. What do we know about the Twitter algorithm? Use a third-party service like Tweroid or ManagerFlitter to tell you what time of the day your followers are usually online. This is the best time to post to ensure that your tweets get as much visibility as possible among your followers. The more visibility a tweet has, the greater chance of engagement it will receive. Some people buy followers to look more influential than they are. Or they use a bot to follow and unfollow lots of accounts to inflate their follower numbers. The problem here is when they tweet and receive little to no engagement. Why? Because the majority of their followers are either spam accounts or irrelevant. To create engaging tweets you must have a relevant and responsive audience. Don’t add any kind of account in the hope they’ll add you back. Instead, be highly specific with the accounts you follow and over time those types of accounts will follow you back. Your Twitter Analytics provides you with a wealth of data not just about your tweets but about the demographics of your followers. It will tell you their subject interests and break them down by percentage. Once you understand your follower interests you can create tweets for them. The more relevant they are the more likely they will engage. Twitter has stated that tweets that use more characters get more engagement. Why? Because you can add more information and more context. You can also be more creative. Do this and the Twitter algorithm will reward you for it. Ensure your profile is up-to-date and you have all the relevant information (name, bio, location, links, photo etc) filled out. The algorithm favours accounts that it deems credible so do not be spammy, post broken links or use automation software. If you’re tweeting every day and providing value to your followers, the algorithm will reward you for it. If your tweets from the past week received engagement the algorithm will prioritize you further. It’s about showing up every day and adding value to a relevant audience. When you retweet and @reply other people and they respond, the algorithm will place any further tweets of yours in their timeline (provided they are following you). Engaging with other Twitter accounts ensures that the algorithm sees you as a contributor to the community. Don’t just tweet out and expect people to engage with you – go out and engage with others. While the LinkedIn algorithm hasn’t been on the end of as much controversy as Facebook or Twitter, it has certainly had a few hiccups along the way. In September 2016, LinkedIn was accused of showing a preference to men over women when looking for candidates using its search feature. A few months before that, LinkedIn users had fun and games with people who have names that are double entendres. Bart Simpson played no part in any of this. LinkedIn has perhaps been one of the most open social networks about how its algorithm works. In March 2017, it’s data team published a blog post titled, Strategies for Keeping the LinkedIn Feed Relevant which included an algorithm diagram of how it combats spam. 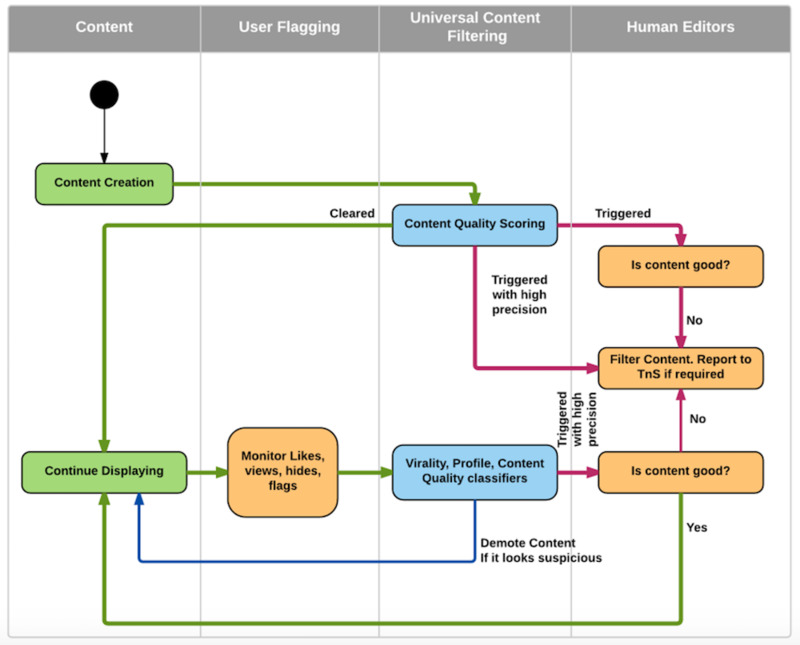 What is telling from the March 2017 post is that LinkedIn uses human intervention as well as its algorithm to determine content quality. If a post begins to receive a lot of engagement “real people at LinkedIn” will analyse it and decide whether it’s good enough to be seen by a wider audience on the platform. Insider tip: keep your LinkedIn network relevant to the types of content you share on the platform. It will have a greater chance of spreading if most of your contacts are in the same industry as you and value the same kind of content. In March 2018, the same team published another blog post titled, A Look Behind the AI that Powers LinkedIn’s Feed which provides insights as to what the LinkedIn algorithm values. The engineering team say that when a user logs into the platform, the LinkedIn algorithm sorts through tens of thousands of posts and ranks the most important ones at the top of the feed. From this they use thousands of signals to determine a user’s preferences which they use to personalize the feed for specific member. “By inputting these signals into our algorithms, we are able to generate personalized news feeds for every member and ensure they are having the conversations they need to become more productive and successful. In 2016, LinkedIn published a post detailing its ‘Knowledge Graph’’ which is based on users’ jobs, titles, skills, companies, geographical locations, schools, etc. Last year, the company announced the proposed ‘Interest Graph’ that represents relationships between members and a taxonomy of topics. This means that with the Knowledge Graph and Interest Graph, the LinkedIn algorithm will be able to match people not only by their jobs but also what they enjoy in their personal lives too. This will be a very powerful algorithm and perhaps more than what the Facebook algorithm can achieve. The LinkedIn algorithm gives your content virility by showing it to the connections of those who engage with it. If someone engages with your post either by commenting on it or liking it, the algorithm will show that comment or like to their 1st-degree connections (your 1st or 2nd). So, let’s say someone comments on your post, the LinkedIn algorithm will show it to five of their connections. This is how your content is amplified outside of your 1st-degree network to your 2nd and 3rd-degree connections. They are one sentence paragraphs designed with a narrative, emotional hooks and social triggers. The best-known creator of ‘broems’ is growth hacker, Josh Fechter, who has created some serious viral posts on LinkedIn using this method wracking up 200 million views in the process. While broems are not to everybody’s taste, there’s no denying this style of posts is LinkedIn algorithm friendly. As we know, however, algorithms never stay the same and already users of the broem are acknowledging that they don’t receive the same traction as they once did. What do we know about the LinkedIn algorithm? If your LinkedIn network is full of people from a myriad of industries and sectors then your content won’t resonate with all of them. Instead, keep your connections relevant to the industry you’re in so your content has more chance of appealing and being shared by them to your 2nd and 3rd-degree networks. Users report that statuses receive more visibility than actual blog posts. This is surprising given LinkedIn’s focus on publishing content and the greater effort it takes to write a blog post. While this might change in time, this is the way the LinkedIn algorithm prioritizes written content for now. While LinkedIn hasn’t specifically said the algorithm will prioritize native imagery or video, given its focus on the latter and how other social networks have prioritized it, we can assume that if it currently doesn’t, it will. While broetry isn’t dead yet, it’s not as viral as it once was. Take a leaf out of Josh Fechter’s book and mix up your writing styles. Use broetry alongside regular writing styles and paragraph structures. Most brands and people prefer to use the social networks to drive traffic to an owned channel like a website or a blog. These days it’s increasingly harder to do so as the algorithms prioritize native content over external links. The LinkedIn algorithm, however, will still drive a lot of traffic to your owned channel provided you don’t abuse it. While not as famous (or infamous) as the Facebook algorithm, Instagram’s is certainly the coolest social media algorithm and perhaps the most important for the future as Instagram increasingly becomes a force in changing consumer culture. Instagram is without a doubt the hottest social media platform and will likely be for some time. It has changed entire industries like the fashion industry where trendy publications like Vogue no longer dictate what’s in and what isn’t. It’s now the main platform for people to become influencers as Instagram has made the creative process that much easier than any other social platform. Instagram influencer marketing is booming with the data showing a continuous upward trend. Instagram is home to influencers from all walks of life from fashion, fitness, travel, gaming, pets and even CGI influencers. Using Instagram tools and apps anyone can become ‘insta famous’ if they’re talented enough and put in the work. Like its big brother site, Instagram has also had its share of negative media coverage recently although nowhere near the extent that Facebook has. For starters, there are a lot of people trying to game the Instagram algorithm to look more influential than they actually are. It’s not uncommon for people to use bots and services that automatically follow and then unfollow other accounts and comment and like on their content. Rather than create real followership and engagement, it’s a manipulation of the system which Instagram seems to do nothing about. Worse than this is the people who buy fake followers and engagement to bolster their numbers are rife on the platform too. It requires very little ($5-10) to buy a few thousand followers from a third party site and about the same price to get ‘people’ to like and comment on your content. Until this is cleaned up, many fake influencers will dupe brands and agencies into working with and spending money on them. Over the long term they will be found out as the ROI doesn’t match their perceived influence. Instagram announced its own social media algorithm in mid-2016 as a way to provide users with the type of content they will engage with the most. Prior to the Instagram algorithm being launched, the feed worked in chronological order meaning you’d see the latest post at the top. Back then a post had a half-life of 72 minutes whereas now it can receive engagement days after it’s published. Regardless of whether the people you engage with the most publish something the day before, you’ll see it at the top of your timeline when you next login. Engagement is a key ranking factor for the Instagram algorithm. The more likes, comments, comment likes, post saves, DM replies and sent via DMs a post receives, the more weighting is placed on it by the algorithm. What do we know about the Instagram algorithm in 2019? If you post irregularly the algorithm will treat you as a bit player and won’t prioritize your posts among your followers. And why should it? Those who post regularly and contribute the most will be rewarded for it. Engaging with content and users that are relevant to your own Instagram profile will help drive people to your own account. The more you engage with these accounts the more the algorithm will show your content their timelines. One of the three key criteria for the Instagram algorithm is timeliness. Learn when your best time to publish is and post then. If you can get to the top of the Explore page via hashtag usage it can generate hundreds, if not thousands, of likes and followers. The YouTube algorithm is perhaps one of the hardest social media algorithms to crack these days given the popularity of the platform. With 1.5bn global users and statistically the second largest search engine in the world, YouTube is a platform to be reckoned with. The YouTube algorithm has been developed to serve those that contribute the most to the site. This is reflected in some of its ranking factors which are based on posting consistency and the number of subscribers a user has. Unless you’re famous, superbly talented in some way or have a completely different angle to creating videos than anyone else, building a substantial audience on YouTube from scratch requires a lot of work. Why? Because the quality of content is exceptionally high and every topic imaginable has been covered already. On top of this, it requires posting of around 2/3 times a week to gain algorithmic traction. This is why YouTube SEO is a growing industry and many ‘traditional’ SEO experts like Brian Dean are beginning to focus on and hone their skills on the YouTube platform. Over the last couple of years, YouTube’s recommendation algorithm has come under fire because of questionable comments on videos of children and also its search autofill relating to pedophila. This led to a number of major brands suspending advertising on YouTube until the issues were fixed. At the time of writing, a similar issue has occurred once more with the YouTube algorithm at the center of it. Huge billion dollar companies like Google/Alphabet and Facebook are not in full control of the use of their own social media algorithms. Worrying? Slightly. In May 2018, many YouTube influencers were angry at the platform for carrying out algorithm tests that gave viewers recommendations of videos of channels they weren’t subscribed to over the ones they were already subscribers of. YouTube said it only ran tests on a small percentage of users but nevertheless some YouTube stars were annoyed and publicly spoke out against the move. Something to bear in mind is that users – even the most influential of users – don’t have full control over their channel or content on any social media site and never will. It’s rented land. What do we know about the YouTube algorithm in 2019? Channels that are sporadic in their video content uploads will be marked down by the algorithm. The best approach is to publish videos consistently and preferably at the same time and/or day each week. Not only will this help you from an algorithmic perspective but your subscribers will be more receptive to new videos when they know they are due out. The more subscribers your channel has the more credible you are in the eyes of the algorithm. This is a catch 22 situation for anyone starting from scratch and looking to grow a YouTube channel making it all-the-more difficult for newbies. Of course you should be doing this anyway but the more likes your video receives the more the YouTube algorithm rewards it. Make videos that your target market will enjoy and don’t be controversial to encourage ‘thumbs down’ responses. The longer people watch your videos, the more interesting the YouTube algorithm will assume it to be. The aim is to hook the viewer in as soon as possible and many YouTubers use specific tactics to do so. Matt Gielen found that videos which are 7 – 16 minutes in length receive the best retention, most engagement and best viewer-to-subscription rate. Social networks continually A/B test and change their algorithms to accommodate new features, revenue streams and provide more value to users. While we’ll never completely understand the inner workings of each social media algorithm, we can take cues from company announcements and adjust our approach accordingly. We can decode the social media algorithms piece-by-piece through our own experiences and by sharing learnings with one another. Using crumbs of information, basic assumptions, some common sense, continuous testing and the sharing of data, these mystical bite-sized chunks of mathematical equations can be cracked. Much like the SEO industry was born out of a collective desire to crack the search engine algorithms, we too can work together to make sense of their powerful social media counterparts that are shaping society and culture. This means continually testing content to discover what works, what doesn’t and, in either case, why. It requires speed and agility when it comes to social media communications. It requires a collective sharing of knowledge and experience. And perhaps it requires a collective sharing of clout to pressure the social networking companies to provide more information on the inner workings of these mysterious algorithms that are having a greater influence on how we all live. This is my starter for ten. If you have anything extra to add, feel free to let me know.